The Zika virus outbreak in South America and Puerto Rico is a reminder of how much harder at-risk populations are hit by such threats. In the U.S., this includes those with lower incomes, those less proficient in English, those with functional needs or requiring skilled nursing care and those with limited mobility. In a recent Health Affairs article by Alexandra Phelan and Lawrence O. Gostin, the authors point to the disproportionate harm Zika will bring to poor women and their children. As U.S. public health agencies at all levels of government prepare for Zika, care must be given to include the needs of these individuals in the planning. State and local public health agencies that have received the Public Health Ready designation from the Centers for Disease Control and Prevention and the National Association of City and County Health Officials have already given serious consideration to how to meet the needs of vulnerable populations during an emergency. One of the criteria for receiving a Public Health Ready award is providing evidence of incorporating vulnerable populations into planning efforts, describing the vulnerable populations and outlining the processes for and the agency’s role in providing services to vulnerable populations. The program also assesses departments on whether their messaging includes processes and procedures for reaching vulnerable populations and whether their planning addresses the need to shelter those with access and functional needs during an emergency. Marc Barbiere, emergency management coordinator for the Fairfax County Health Department, agrees with the importance of reaching out and engaging various groups with access and functional needs. He notes that his department and county attempt to meet their ethical obligations to at-risk groups by involving a diverse range of stakeholders in the planning process. Planning at all levels attempts to partner with vulnerable populations by taking into account groups with a variety of different languages and cultures, as well as those who are home-bound and isolated. Michelle Hill, a nursing program specialist and public health preparedness planner for the Florida Department of Health in Santa Rosa County (DOH-Santa Rosa), notes that health departments in their state are required to do a vulnerable populations survey each year. This survey involves collaboration by the public health preparedness and emergency management personnel. The needs of these groups are determined and then efforts are made to target those needs. One approach is to provide a special needs shelter that would be activated during an emergency. 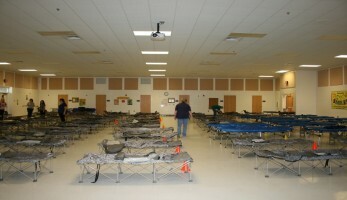 Efforts are made to contact those who would qualify for the shelters and a registry of these individuals is maintained. Home health care and hospice organizations are provided with information regarding the qualifications for the shelter. According to the Fairfax County emergency operations plan that department also maintains a medical needs registry to track those in need of assistance and facilitate transportation to shelters. Authorities in Fairfax County recognize the need to be sensitive to specialized needs, including the use of service animals. The DOH-Santa Rosa has also been active in establishing closed points of dispensing (POD) for medical countermeasures for those groups who might not be able to be transported to a special needs shelter. Such closed PODs would require a facility representative to come to the health department, receive the countermeasures and return them to the facility for dispensing. First priority is given to those facilities populated by people who cannot be transported safely, such as hospitals, nursing homes, assisted living facilities, mental health hospitals and prisons. Secondary priority is given to churches, urgent cares, physician offices and big businesses. In the pre-disaster recovery plan for Fairfax County, it is noted that those who go into an emergency situation with a low degree of preparedness, financial capital and social connections are equally likely to be disadvantaged during the recovery phase. Therefore, Fairfax County’s recovery plan, like Santa Rosa’s, stresses fairness and transparency in balancing the needs of diverse populations. Emergency management personnel in Fairfax County also consult with the Office of Human Rights and Equity Programs to make sure all considerations are taken into account. In the event of a large-scale public health emergency, the brunt of the impact is likely to be felt by those who are less able to weather the crisis without assistance. Phelan and Gostin describe the fight against Zika as a matter of social justice for poor Americans and call upon Congress to meet the moral and ethical imperative. That is why it is essential that public health emergency planning give due consideration to the needs of vulnerable populations and make them a part of the process. This is not only important from an ethical and humanitarian perspective, but also in terms of managing the emergency. As demonstrated by the progression of Zika in countries like Brazil, if viruses are allowed to take hold in more vulnerable parts of a community, the threat can quickly spread to encompass the community as a whole. Therefore, providing adequate protections to vulnerable groups is not only an ethical imperative, but a matter of good emergency management. Author: Nathan Myers is an assistant professor of political science at Indiana State University. He primarily teaches courses in the Master of Public Administration program. Myers is also a member of the ISU Center for Genomic Advocacy. His teaching and research interests include organizational behavior, public health policy, and biotechnology policy associated with genomic research.